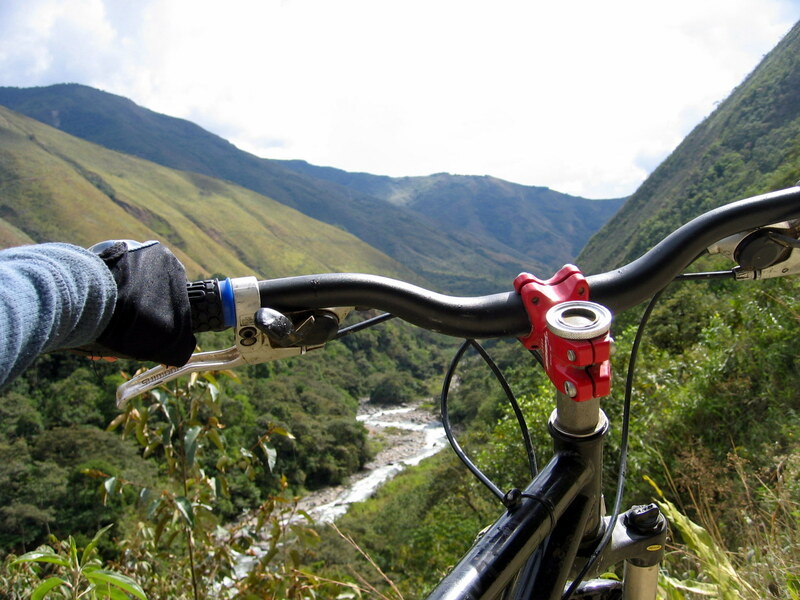 The so-called Inca Trail offers numerous alternative routes nowadays. From the classic (and probably over-exploited) one to the “jungle trail” I chose. 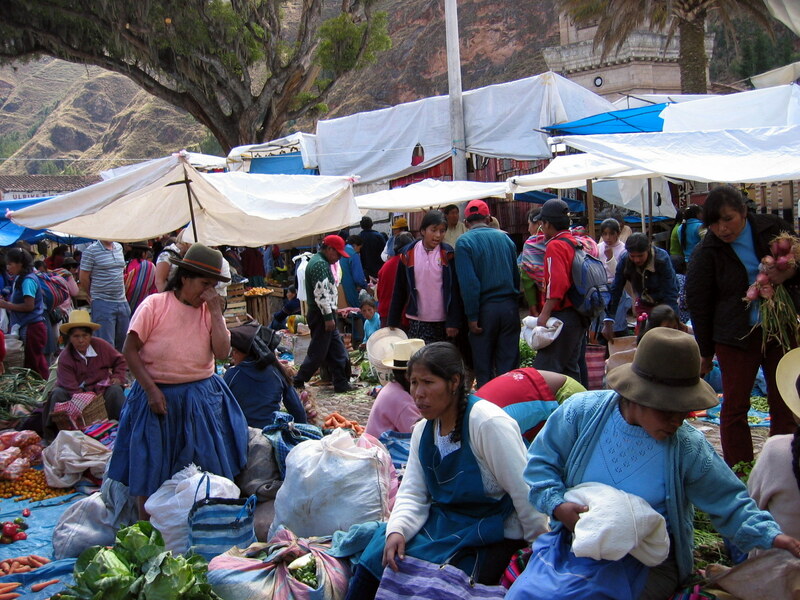 Every tourism agency in Cuzco sells this tours, and travelers then get grouped and handed over to a handful of guides. The main challenge is actually to get a train ticket to return to Cuzco after hiking to and visiting Machu Picchu, as the only direct railway (www.perurail.com, controlled by a Chilean company to the locals’ frustration) tends to be sold out during high season. Alternatively, you can take the train back to Ollantaytambo (www.incarail.com.pe, this one a Peruvian concession), and then a bus. I’d recommend booking your own return train ticket online before getting to Cuzco and negotiating your Inca Trail package. Agencies are not allowed to buy tickets upfront and will simply take you (or your passport) to the booking office. If you bring your own ticket, they’ll simply discount that from the price. Our excursion began with a full day of mountain biking, mostly downhill, from the pass of Abra la Raya (at 4300 m) to the village of Santa María (at 1800 m). It was fun and exhausting, especially for my arms, due to the wild conditions of the “road”. The second day, we hiked for 8 hours on the side of the mountains (the narrow line you see in the picture was our trail), over the Urubamaba river, to reach Santa Teresa. We crossed hanging bridges, waterfalls, and daunting outlooks, and took a regenerating bath in some hot springs at the end. 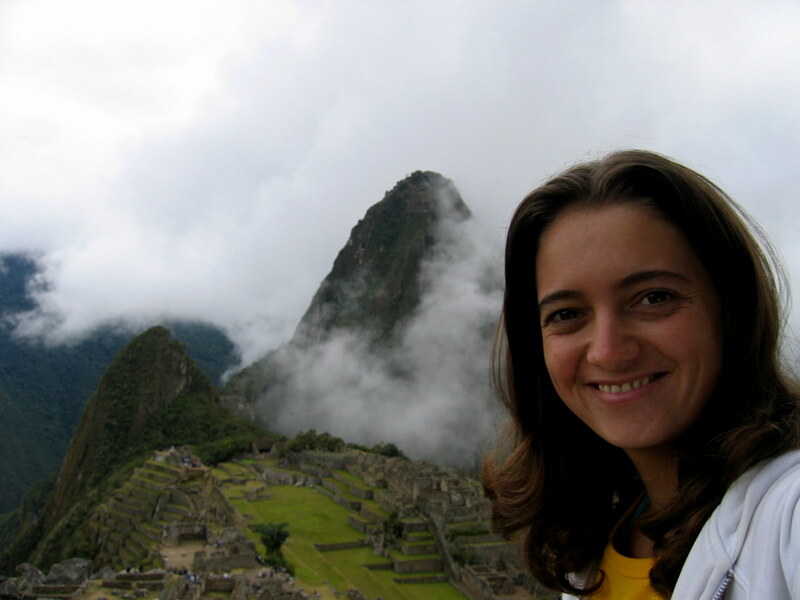 Both in Santa María and Santa Teresa we stayed in local guest houses, humble but enough for our needs. And we ate what the families served us, mainly soup, chicken and bananas, and drank chicha morada, a sweet purple corn beverage, maybe my new favorite juice. The towns are quite developed, due to their location, but still preserve some much-appreciated authenticity. In Santa Teresa, we even ventured into a local “club”. My group, the kind of heterogeneous backpacker gang you could expect in this situation, proved to be fun and interesting. 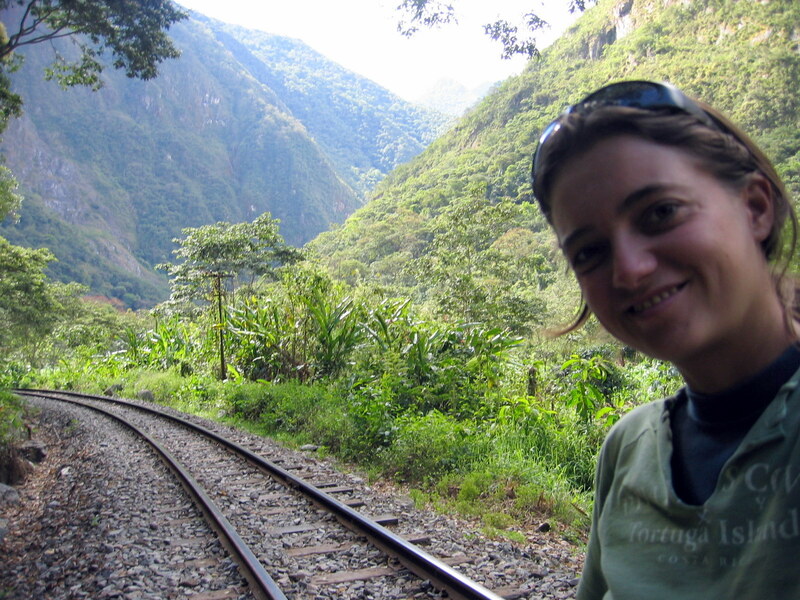 On the third day, we completed the easy hike on the train rails from the hydroelectric central to Aguas Calientes. 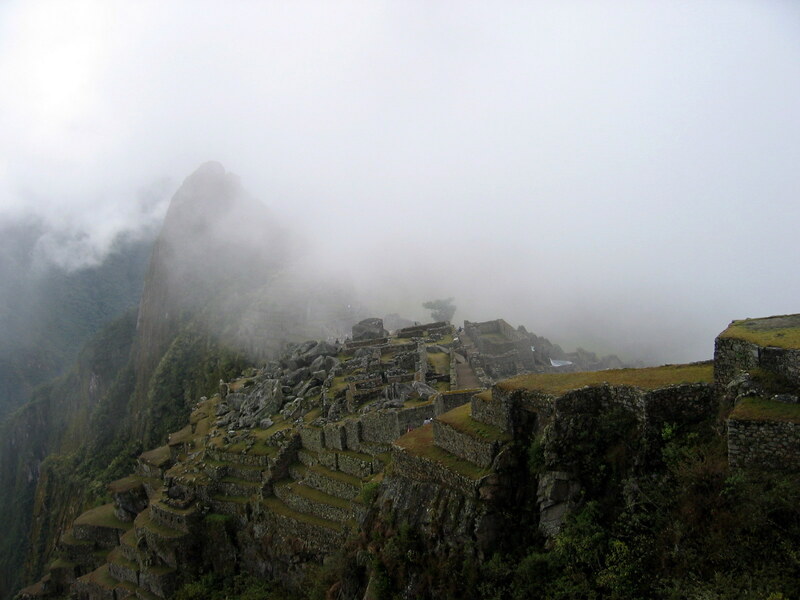 Oh, almost forgot to mention that Cuzco is worth spending time at. 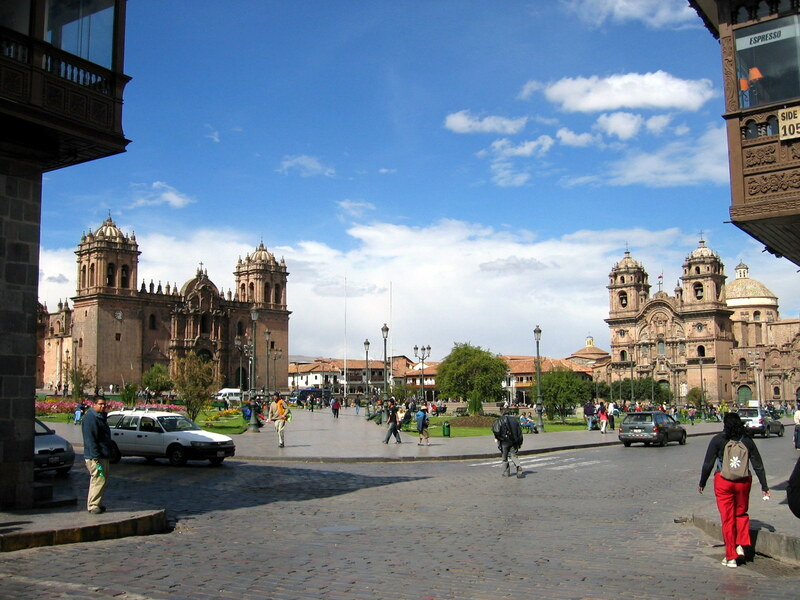 The Plaza de Armas is a perfect representation of colonial architecture, and the 12 angle stone a symbol of the talented Inca culture. The city is very easy to explore on foot, with its cobblestone streets, and there are lots of local markets and eateries. 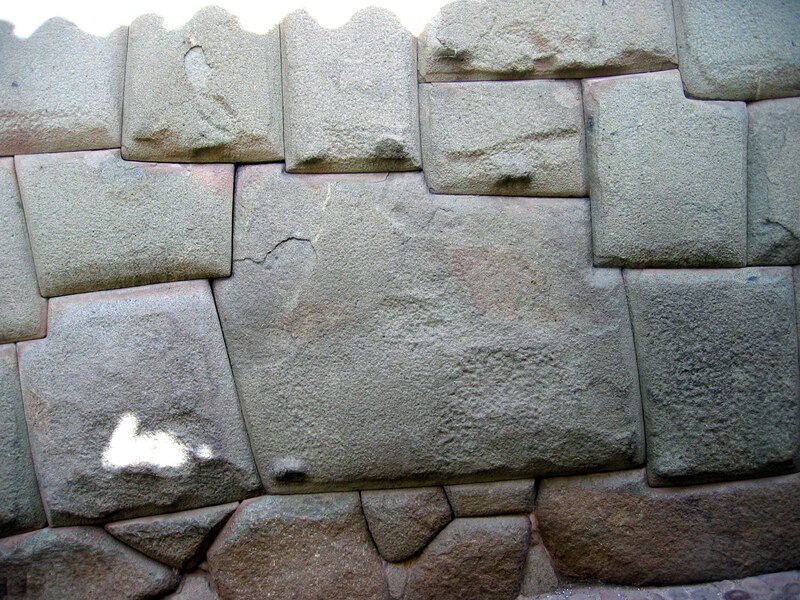 Cuzco is also a great center to explore surrounding towns and ruins. My favorite was Ollantaytambo, which I visited on a day-trip on public bus (~1.5 hours each way). After wandering around the center and grabbing some food, I paid a local to give me a ride up the hill where the ruins are located. I got off before the gate and hiked cross-country to avoid the entrance fee (my funds where rather low after traveling for months). 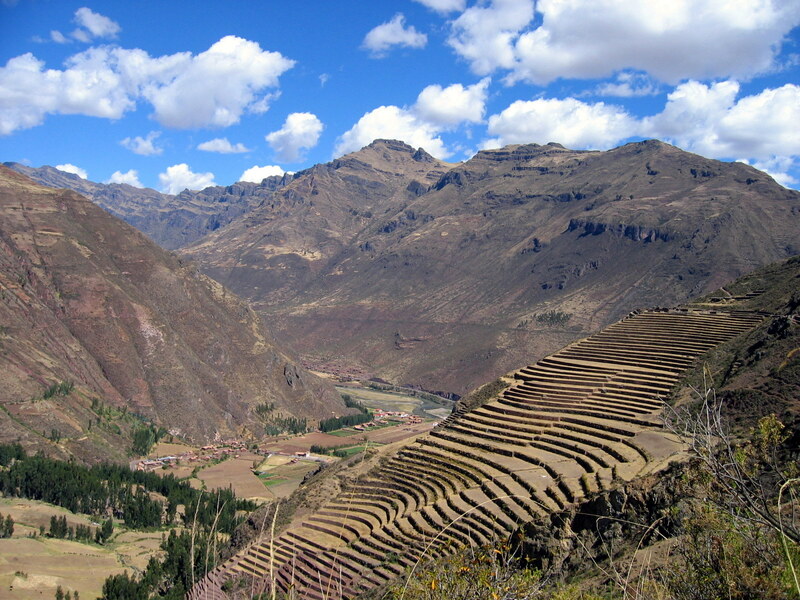 Perfect agricultural terraces cover the side of the hill, with storehouses and a temple further up. 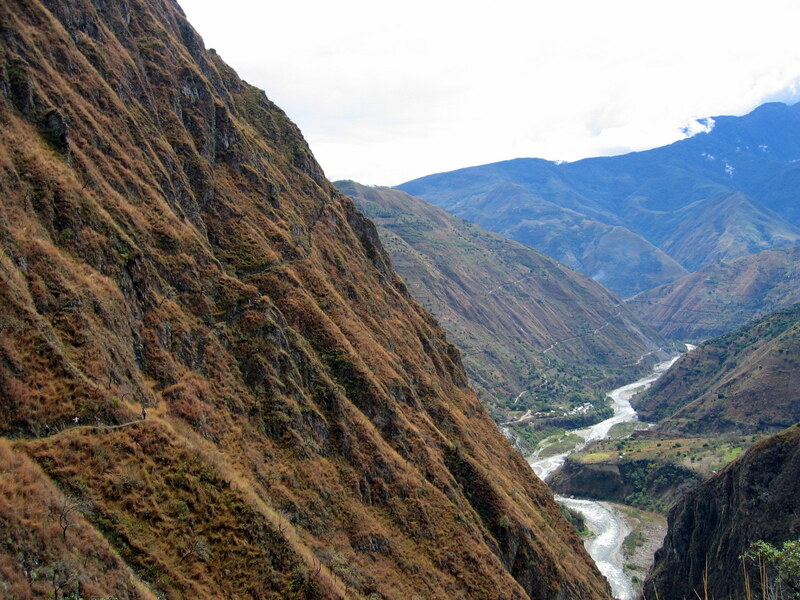 The Cuzco area is a great introduction to Inca history, before heading to Machu Picchu. Found you from Marek’s blog. 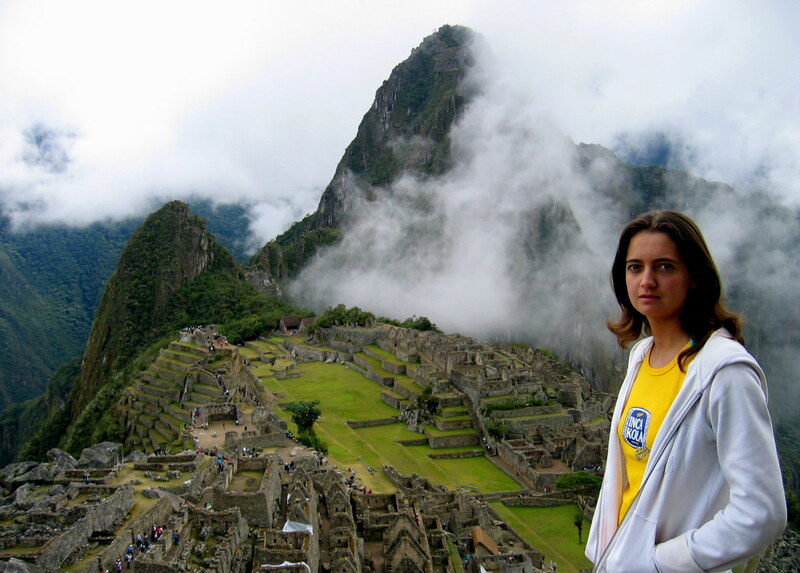 LOVE your first photo of Machu. Went on the Inca Jungle Trek. also to the Amazon, hopefully it inspires people to go for eco-tourism and helps preserve the jungle! … huge trees of the Tombopato Reserve and … the macaw clay-lick on the Tombopato River of Peru hope it might help! Keep traveling!!! I greatly appreciate this article and the information provided. Thank you very much!